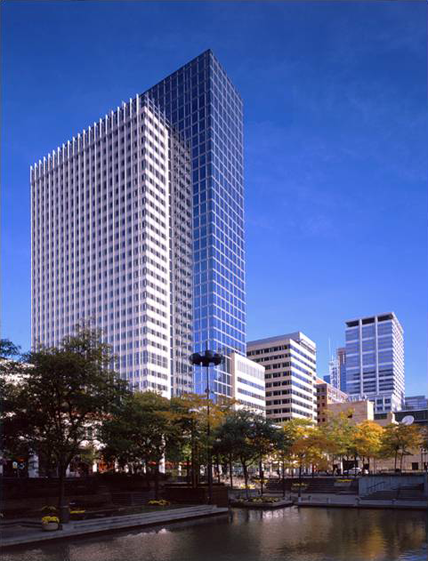 Gary Johnson as part of the Ellerbe Becket design team created a mullti-block series of building structures for Target Corporation linked together by skyways, and retail uses at first and second levels. Architect Gary Johnson contributed to both exterior shell design and interior design. Mr. Johnson’s developed aspects of the curtainwall, i.e. suspending vertical aluminum flutes in front of bands of ribbon windows. As the sun moves, shadow lines change during the day adding richness to the façade. Gary Johnson and other Ellerbe Becket architects worked with a consultant to conceive of a the “Northern Lights” moving backlit top for the building. For the main lobby on the skyway level, Gary Johnson sketched out an elongated elliptical gesture that would tie these circulation points together and accommodate the low ceiling height. Dramatic cove lighting, a brightly painted artist mural, frosted glass, and people entering the space from a number of access points created a dynamic environment.